Jack Campbell—the pseudonym of a retired US Navy officer—wants to tell us some stories about honor and large space fleet actions. He wastes no time introducing us to the protagonist or lecturing us about the righteousness of the good guys (the Alliance) or why they are fighting the bad guys (the Syndicate Worlds). We jump right into the fray, and we’re only allowed to see some character depth when he is confident that we are well acquainted with the dynamics of space fleet actions. The protagonist, John “Black Jack” Geary, has just been found in his escape pod a hundred years after his legendary battle at Grendel. While lost and in suspended animation Geary was promoted from Commander to Captain. So now he is considered the most senior captain in the entire fleet and, more importantly, a legendary hero that has come back to save the Alliance. That is indeed a big deal in an interstellar civilization whose only religion is dedicated to worshiping one’s ancestors. Properly speaking the fleet is not lost. It is just very deep inside enemy space trying to put an end to a war that began precisely when the evil Syndics attacked the Alliance at Grendel. But things go so wrong that the good guys lose all their top brass. Geary is still under the physical and psychological effects of his long sleep when he finds himself in charge of the entire fleet. And all that in just the first few paragraphs. From Geary’s perspective, he was a Commander just a few days ago. He never expected to be lost in hibernation for a century or to wake up as a legendary hero. Or that the war would still be going on. And he certainly would have never imagined an Alliance officer to condone atrocities that in his time not even the Syndics would commit. Our hero is all for democracy but he will have none of that nonsense in his chain of command. Military life has become a tedious game of dishonest politics, and Campbell uses this to present the contrast of military expediency versus democratic debate. 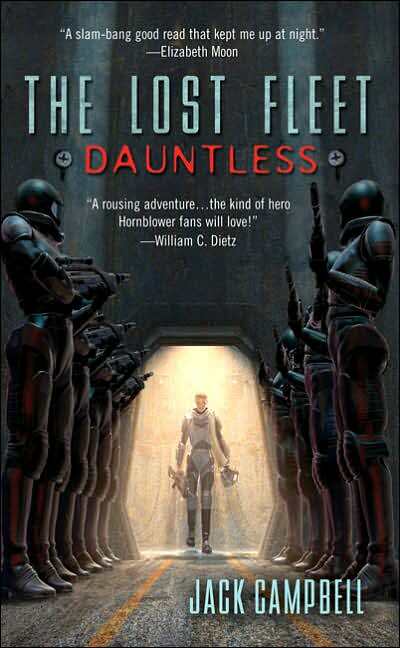 In Dauntless, this conflict primarily serves to test Geary against his domestic adversaries. But in later books it grows into some serious dilemmas for him and his friends. Geary does his best to correct all this decadence. Later, as he starts achieving some victories, he earns the crew’s trust and some nascent friendships. Campbell wants us to share the lonely burden of command that has fallen on this decent and competent officer, a righteous leader who rights the wrongs among his own people while fighting an evil enemy. And, to his credit, he never needs any lengthy sanctimonious monologue to explain why both petty politics and war crimes are simply unacceptable. Geary is a reliable man that you can look up to and learn from, exactly the kind that seems to have faded away from that war-torn civilization. Oddly, a century of war has not really spurred military innovation and Geary’s skills are not hopelessly outdated (as an officer from the early days of World War I would be in 2014). On the contrary, many sound techniques have been forgotten along with some time-honored traditions and the sense of honor. Thus, as Geary reintroduces the military courtesy of the formal salute and several basic maneuvers, Campbell gets us acquainted with the mechanics of space fleet operations. Chapter after chapter we find the Alliance fleet jumping from one star system to another as the Syndics chase them. The initial scenes of these jumps are very reminiscent of the reimagined Battlestar Galactica, a TV series that premiered just three years before the book was first published. More than once I found myself expecting to hear Lt. Felix Gaeta reporting “multiple DRADIS contacts” to Admiral Adama. But the battles that ensue are completely different. Campbell has clearly thought very carefully about the tridimensional geometry and timing of space battles fought at one tenth of the speed of light. We learn about the different types of ships, their speeds, and weaponry. Reading Geary’s orders and thoughts we learn to take into account the time that it takes for light from the battlefield to reach the protagonist. That’s the time he has to wait to know what’s going on there. It’s also the measure of the element of surprise that he gets when jumping into an enemy star system: he can see what was going on X hours ago at X light-hours away, and that is also how long it will take the evil Syndics to notice his arrival. Like an artisan enamored with his craft, Campbell painstakingly plans his fleet actions and makes sure we can picture the epic space battles with mathematical precision. Sometimes it is tempting to grab a piece of paper to sketch the 3D battle plan—except that the battle is so engaging that it’s better to read on. But there are other times when Campbell goes a little too far: he leads us through Geary’s thoughts about the next encounter, then we witness the briefing where he talks about it with the captains of all the ships and then, at last, we see the real fight. Then again, maybe the less geometrically-minded will thank the extra explaining. That is not to say that this book is for the ‘visual guys’ only or that you’ll have to dust off your trigonometry. You don’t need to mentally build the battles, but Campbell is always happy to supply all the pieces and detailed instructions. Far less attention is paid to character building. However, there is a certain character that deserves a special mention. That is Madam Co-President Victoria Rione, a female politician (yes, you know where this is going). Like a low-quality girlfriend from the blue-pill days she is perfectly deplorable, stubbornly obnoxious, and yet she just as perfectly fulfills a role. Rione would have been an interesting villain, she’s the kind that says “don’t trust me” when asked to give advice. Indeed, after reading the first few lines that she throws at Geary I was thinking “throw her out the airlock already!” But Campbell had very different plans for her. In this the first book of the series, Campbell hints at a love triangle involving Geary, Rione, and Captain Tanya Desjani, the commanding officer of the flagship. And he lets us tell the two women apart with all the subtlety of an orbital bombardment. While Rione is in the habit of methodically questioning and preemptively blaming Geary for things he has not done (and he know he’d never do), Desjani is his most loyal and devoted admirer. She believes that “the living stars” have sent him to them—to her—to save the Alliance. But Geary, the archetypal reluctant hero, doesn’t see himself as Black Jack, the legendary fantasy that the politicians manufactured to boost morale. The book, by the way, seems to be titled after Desjani’s ship, the Dauntless. And the following books are titled Fearless, Courageous, Valiant, etc. But even though there are ships in the fleet with such names, those books are not really centered on their seeming namesakes. So Campbell must be merely qualifying Black Jack Geary. The whole The Lost Fleet series is structured in chapters, roughly one for each star system. Every jump into a new system is a cliffhanger because the fleet is never quite sure what to expect so far behind enemy lines and Geary is always wondering were to jump next. Having to deal with such important and frequent unknowns, Campbell doesn’t try to overawe us with shocking plot twists. Good review. I agree with it for the most part. I might give it a little higher rating, but with the x/10 rating maybe not quite 8/10 so no quibble there. The one thing I would point out is that the books end on cliffhangers just like the chapters. If buying in hard form decide if you want to read the next one long enough before finishing the current volume to go purchase the next one. I have read the first series. Waiting for each of the others to be finished before starting them for this reason. It sounds interesting but, the pricing of these ebooks has turned me off. I’m getting too used to Castalia I guess. Then, to, Amazon has finally convinced me that, since with the drm where they are trying to wholly control these books, I don’t really own them. And, should Amazon fall I’m stuck with a whole library, and that’s no exaggeration at this point, that has suddenly become useless. Unless they do the right thing and, as the last employee leaves the hallowed halls of Amazon, pushes a button that releases an applet that will strip the drm off the books of their loyal customers. I don’t plan on holding my breath waiting for this to happen. Now, if I did have full control over the books I would probably try this series out. I own around 5 of these books and have read 3 and a half. The first two were interesting but then they start to feel like copies of one another. I would give the first 8/10 second 7/10, third 6/10. OK. A follow-up. Noticed today that the price of Dauntless has dropped somewhat. So, I got it and will probably enjoy the thing. If so, will probably get 2 and 3 of the series. Time will tell. Does sound like my kind of book.